Home » Community Happenings » Bit o’ Lit: Forklift-Museum Partnership Lets Teens Sow Gardens of Reading Across D.C. 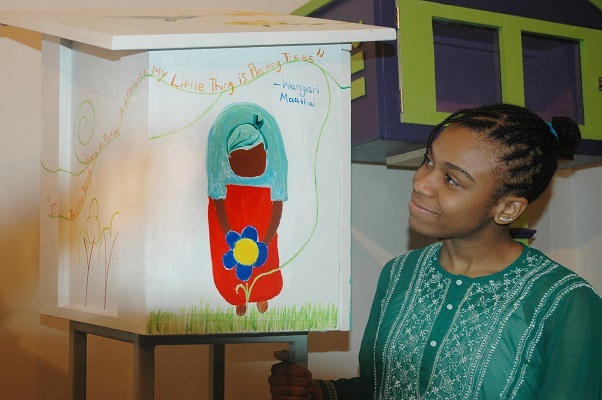 Bit o’ Lit: Forklift-Museum Partnership Lets Teens Sow Gardens of Reading Across D.C.
Paris Hicks, a 16-year-old high school junior from Anne Arundel County, painted this portrait of Wangari Maathai for the Little Free Library destined for Wangari Gardens. Wangari Maathai was a Kenyan environmental activist who received a Nobel Peace Prize in 2004. Perhaps a cantankerous and obstructionist Congress should consider convening at the National Building Museum instead of the U.S. Capitol. Why? Legislators could likely pick up pointers on cooperation, camaraderie, completion, leadership and esprit de corps—from teenagers. A little library, as presented April 26 at a reception at the National Building Museum. 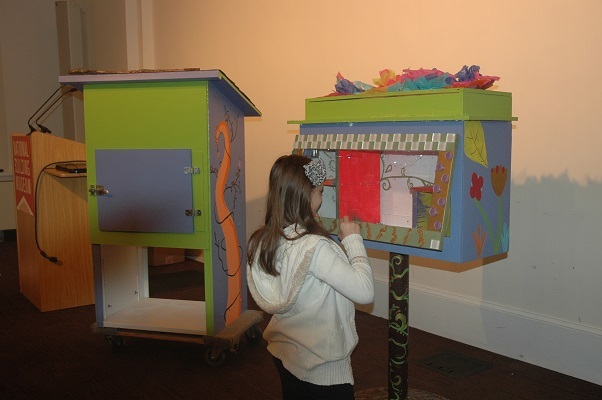 This spring, 27 imaginative and motivated 13- to 18-year-olds devoted eight Saturdays at the downtown D.C. museum to scheming and then crafting five unique Little Free Libraries that will soon adorn a handful of community gardens sprinkled throughout the nation’s capital. The pint-size libraries—part of a global movement launched in Wisconsin in 2009—promote take-a-book, return-a-book gathering places where neighbors can share their favorite authors and stories. A grand opening at each D.C. garden is set from 11 a.m. to 1 p.m. on Saturday, May 17. The young library builders are participants in what’s called the Design Apprenticeship Program. It’s part of an initiative the National Building Museum created 14 years ago to not only expose students to career possibilities but to hone their observation skills and help them grasp the integral role design can play in how their fellow humans perceive all of the bricks and mortar around them. Lauren Wilson, the museum’s teen program coordinator, was thrilled when she discovered that Little Free Library organizers encouraged recycling. That ethos prompted her to link her spring apprenticeship class with what she calls one of her favorite places, Community Forklift. In mid-March, the five teams of students traveled via school bus to the Forklift to tour its 40,000-square foot warehouse and load up on an assortment of cabinets, shelves, lumber, hinges, small doors, doorknobs, drawer pulls, maple flooring, Plexiglas, table bases, newel posts, shingles, glass tiles and other baubles. Each team had a base budget of $200, which they could bump up by completing homework assignments. 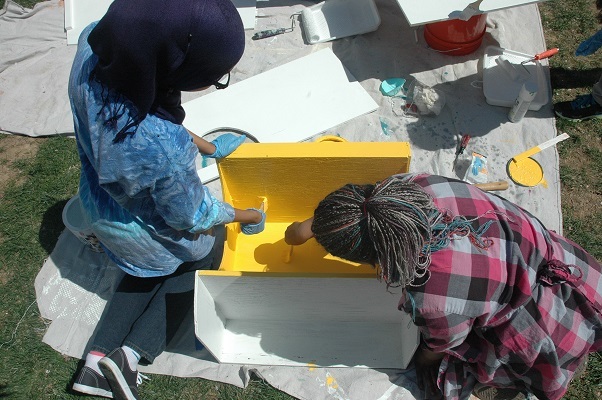 Students Amara McKinney, left, and Yasmeen Webb paint part of the base of their Little Free Library outside the National Building Museum in mid-April. They bought the piece at Community Forklift. The students agreed that their Forklift field trip was “awesome.” But one-on-one interviews revealed that their grasp of the entire program went much deeper than that single-word assessment. Yes, each student had sketched a library design. But it was incumbent on them to collaborate with their teammates to decide what they kept and what they jettisoned. Evangelina Hakes, a 17-year-old from Bowie, says having essentials from the Forklift removed the pressure of creating a project from scratch. 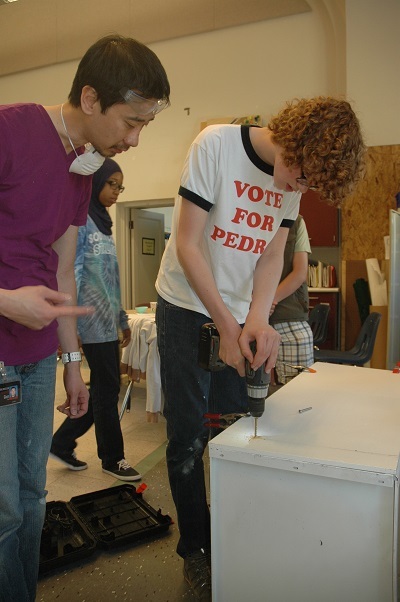 Design Apprenticeship Program instructor Giam Trinh offers a few drilling tips to student Luca Bilke. Zuckerman, a high school sophomore who spends lots of time building biplanes and Lego creations, says this library project helped him have conversations with strangers who became colleagues and also friends. Throughout the spring session, each team had access to a trio of volunteer adult mentors who offered insight and encouragement. 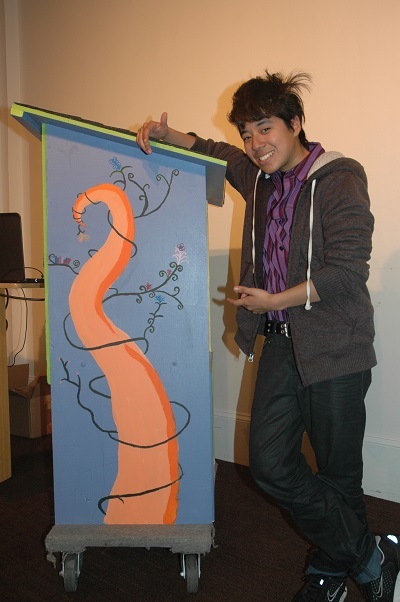 For longtime instructor Giam Trinh, it’s the teens’ enthusiasm and open-mindedness that compels him to return year after year to volunteer with the Design Apprenticeship Program. Over the last 14 years, he and other mentors have guided students as they have tackled projects as diverse as puppet theaters for Head Start classes, set designs for an in-house Shakespeare festival, and furniture for a local school and families in transitional housing. The program focuses on teaching the teens how to work with their hands, manage their time so they can meet deadlines and take an idea from concept to reality, he says. They have to make scale drawings, critique their peers, practice their public speaking and figure out who will lead and who will follow. Early on, each team visited the garden where its Little Free Library would be permanently “planted.” That gave the students a chance to connect with neighbors in local communities and capture the spirit of each garden. The five library recipients are Old City Farm & Guild, Common Good City Farm, Bruce Monroe Community Garden, Wangari Gardens and City Blossoms. Sixteen-year-old Yasmeen Webb is over the moon that her team’s library will be “sprouting” near her own back yard in D.C.’s Shaw neighborhood. It is destined for a garden initiated by the nonprofit City Blossoms in the 1500 block of Marion Street. 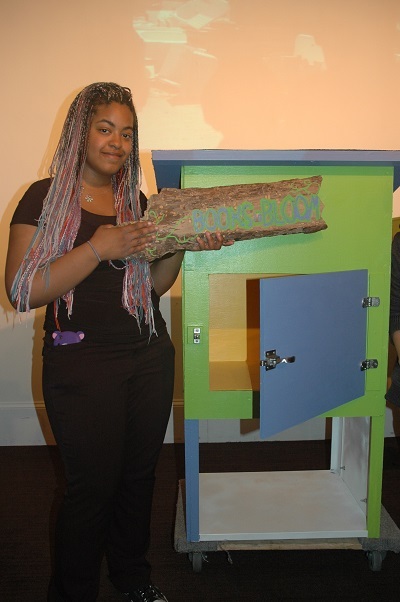 Student Yasmeen Webb holds up the “Books Bloom” painted sign that is the signature of the Little Free Library to be dedicated Marion Street Garden in D.C.’s Shaw neighborhood. Books are bliss for Webb, a junior at the city’s Columbia Heights Education Campus with a penchant for literature, science, art and music. Popular gatherings at the garden already include cooking demonstrations, art classes, potluck dinners, movie nights and seasonal celebrations, such as an event where visitors dressed up as their favorite insect. The cheerful garden, which covers two city lots, fits right in on a block of colorful and appealing row houses. Strawberries and other plants thrive in tires transformed into planters, and reclaimed bricks line pathways adjacent to neatly labeled beds bearing a bounty of herbs, flowers and vegetables. Funky sculptures and a whimsical wall of handmade artwork are as well tended as the rain barrels, the trellis, the birdbath and the compost operation. Readers can find ready-made respite on benches, a pair of picnic tables or a ring of painted tree stumps already set up in a ring suitable for a story hour. 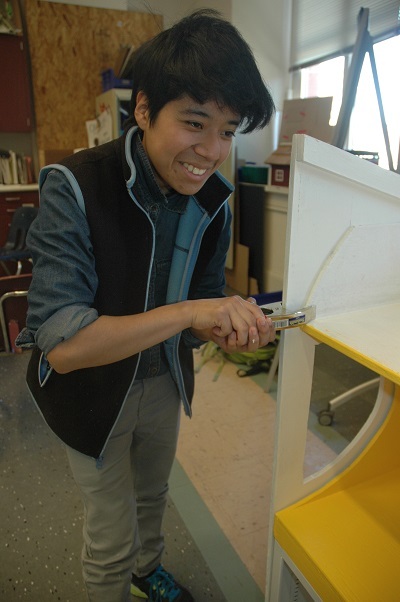 Student Astra Robles-Gottlieb clamps part of her team’s library together. Astra Robles-Gottlieb, a senior at Montgomery Blair High School in Silver Spring, is proud of the way teammates highlighted the themes of creativity, togetherness, family and nature with the library they built for City Blossoms. The 18-year-old appreciates how the Design Apprenticeship Program allowed her to merge her strengths in art and computers, and also forced her to overcome her innate shyness. She hopes it will give her a leg up in a competitive job market as she heads off to Montgomery College this fall to study photography and cybersecurity. 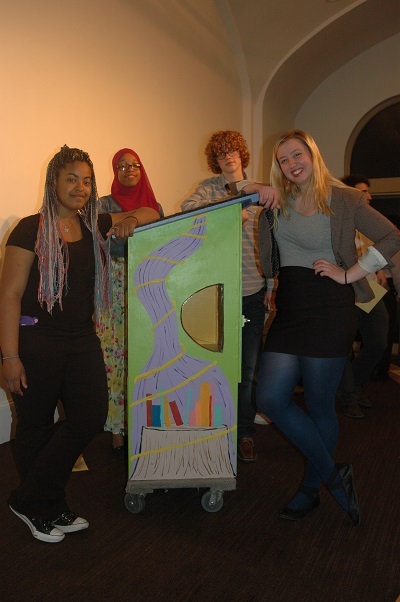 Left to right, Yasmeen Webb, Amara McKinney, Luca Bilke and Evangelina Hakes show how they blended the books and garden theme on one side of their Little Free Library. Astra Robles-Gottlieb gestures to her whimsical handiwork on the other side.